A 15-year-old boy and a 34-year-old man have appeared in court charged with murdering young mother Nattalie Muir in West Lothian. The Whitburn teenager, who cannot be named for legal reasons, and George Stewart, of West Calder, appeared at Livingston Sheriff Court. They made no plea or declaration and were remanded in custody. 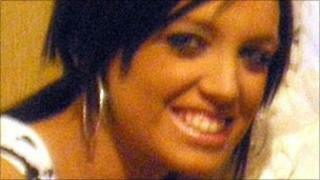 Ms Muir, 21, died at Wishaw General Hospital after an alleged knife attack in Whitburn at 0300 GMT on Satruday. A third person, Emma Merrilees, 19, from Edinburgh, appeared in court charged with attempting to pervert the course of justice. She was given bail. Ms Muir's father, Callum Muir, said his daughter - the mother of a two-year-old girl - was "beautiful, loving, caring and generous" and had a "great personality and sense of fun". In a statement issued on behalf of the family, Mr Muir said: "Nattalie's death has had a devastating effect on all of us, and we are struggling to come to terms with our loss. "She was a devoted mother to her daughter Paige, and was adored by everyone who knew her." He added: "Her loss in such tragic circumstances has been a huge shock to all of us but we will always treasure the happy memories of her as a loving mum, sister, daughter, granddaughter, niece, cousin, and of course, friend. "We still cannot believe that this has happened to such a loving and happy young person."